Lei, Z., Chen, L., Wei-Heng, D. (2015). Effects of Modified Pyrolysis Tar on Gas Desulphurization Performance. Iranian Journal of Chemistry and Chemical Engineering (IJCCE), 34(1), 49-56. Zhang Lei; Li Chen; Dong Wei-Heng. "Effects of Modified Pyrolysis Tar on Gas Desulphurization Performance". Iranian Journal of Chemistry and Chemical Engineering (IJCCE), 34, 1, 2015, 49-56. Lei, Z., Chen, L., Wei-Heng, D. (2015). 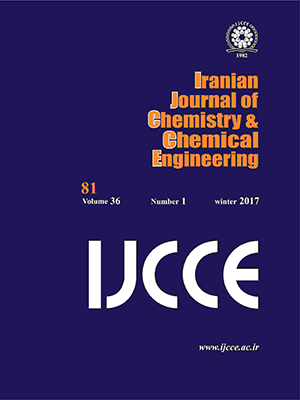 'Effects of Modified Pyrolysis Tar on Gas Desulphurization Performance', Iranian Journal of Chemistry and Chemical Engineering (IJCCE), 34(1), pp. 49-56. Lei, Z., Chen, L., Wei-Heng, D. Effects of Modified Pyrolysis Tar on Gas Desulphurization Performance. Iranian Journal of Chemistry and Chemical Engineering (IJCCE), 2015; 34(1): 49-56. The paper introducedeffects of modified pyrolysis tar on flue gas desulfurization. This experiment selected the pyrolysis tar as the raw material, researched the effects on desulfurization performance under different modification solution, concentration, solid liquid ratio of pyrolysis tar and modified solution, calcination temperature and calcination time by 16 group orthogonal experiments. The results showed that: (1) The significance of five factors impact on the modified pyrolysis tar desulfurization performance in order was: types of the modified solution > modification solution concentration > calcination time > solid-liquid ratio > calcination temperature. (2) The modified effects of nitric acid and phosphoric acid were better. (3) The higher nitrate concentration, the better modified effect of pyrolysis tar. (4) The rate of desulfurization increased mainly associated with acidic groups on the surface of the pyrolysis tar, desulfurization performance get better along with the acidic groups increasing. YangYang, "Sulfur Dioxide Reduction Technology and the Flue Gas Desulfurization ngineering", Metallurgical Industry Press,Beijing, p.23 (2004). Su Qingqing, Development of Coal-Fired Flue Gas Desulfurization Technology, Wuhan Institute of Chem-Ical Technology, 27: 56 (2005). HanYu, The Research Progress on Flue Gas Desulfu- Rization, Energy Saving and Environmental Protection, 2: 78 (2005). Liu Zonghao, SO2 Pollution Situation and Technology in China, Liaoning Urban and Rural Environmental Science and Technology, 3: 23 (2003). Weixing, TangXishan, The Development and Utilization of Flue Gas Treatment Technology Based on Pyrolysis Tar, Worldmetals, 9: 9 (2014). ChenKaidong, YanQijie, ShenBaicheng, The Mecha- Nism of Modified Semi-Coke in Process of SO2 Removal from Flue Gases, Journal of Fuel Chemistry and Technology, 25: 175 (1997). Li Zhihong, The Efect of Preparation and Regeneration Process on Flue Gas Denitrification Performance of the Semi-Coke Adsorbent, Environmental Pollution and Control, 6: 99 (2004). Zhang Shouyu, Zhu Tingyu, CaoYan, SO2 Removal from Flue Gas Using Active Coke from Coal, Journal of Fuel Chemistry and Technology, 9: 201 (2001). Shang Guanju, Yang Zhi, Miao Maoqian, The SO2 Adsorbent Prepared by the Oxidation with HNO3 from Lignite Semi-Coke, Taiyuan University of Science Technology, 38: 229 (2007). Zhang Shouyu, Lv Junfu, Yue Guangxi, The Effect of the Chemical Characteristics on the De-SO2 Capability of Active Coke, Journal of Environmental Science, 23: 317 (2003). Wang Peng, Zhang Hailv, Progress in Surface Chemical Modification of Activated Carbon for Absorption, Carbon Techniques, 126: 23 (2003). Fan Yanzhen, Wang Baozhen, Activated Carbon Surface Chemistry, Coal Conversion, 2: 26 (2000). MaoLei, Tong Shitang, Wang Yu, Discussion on the Boehm Titration Method Used in Analysis of Surface Oxygen Functional Groups on Activated Carbon, Carbon Techniques, 20: 17 (2011). Meng Guanhua, Li Aimin, Zhang Quanxing, Studies on the Oxygen-Containing Groups of Activated Carbon and Their Effects on the Adsorption Character, Ion Exchange and Adsorption, 23: 88 (2007). Alicia M Oickle, Sarah L Goertzen, Katelyn R Hopper, et al., Standardization of the Boehm titration, Part Ⅱ.Method of Agitation, Effect of Filtering and Dilute Titrant, Carbon, 48: 3313 (2010). Zhang Jun, Lin Xiaofen, Yin Jiamin, Experimental Research on the Desulphurization Performance of Biomass Char, Journal of Engineering Thermo Physics, 26: 537 (2005). ZhaoYi, Ma Shuangchen, Li Yan zhong, The Experi Mental Investigation of Desulfurization and Deniterfication from Flue Gas by Absorbents Based on Fly Ash, Proceedings of the CSEE, 22: 108 (2002). Li Lanting, XieWei, Liang Daming, Mechanism of Removal of SO2 and NO on Activated Coke. Environmental Science and Technology, 33: 79 (2010). Zheng Xianrong, Li Chunhu, Fang Jinghua, Removal of SO2 from Flue Gas using Modified Semi-coke, The Environmental Pollution and Control, 27: 498 (2004). Qiao Jinhong, Zhao Wei, Xie Kechang, Study of Coal Char Adsorption Capacity. Journal of Taiyuan University of Science and Technology,, 34: 635 (2005).